On March 30, 2016, a custom designed and fabricated fish “crowder” with underwater camera and solar-powered recording system was installed in the Hanover Pond fish ladder. 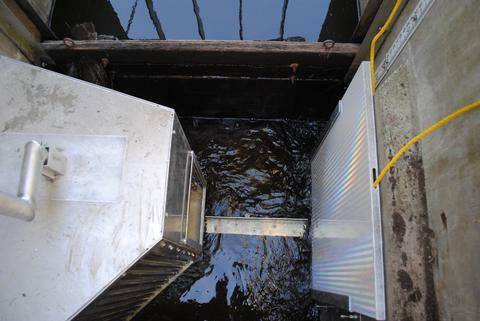 After several days of wiring, testing and alignment, the “stop-logs” at the head of the fish passage were pulled up by State of Connecticut, Department of Energy & Environmental Protection (CT DEEP) fisheries biologists to open the flow of water in the ladder for the Spring migration. NEHC has developed the monitoring system in concert with the CT DEEP as part of an agreement to monitor annual migrations, pre- and post-construction, at the Hanover Pond small-hydroelectric facility that will be built this summer and producing power by late autumn of 2016. The results will be shared with U.S. Fish and Wildlife as part of the agreement. Hanover Pond dam is on the Quinnipiac River, an active recreational and educational area fostered by the Quinnipiac River Watershed Association (QRWA). The small-scale hydro facility will be the first use of Archimedes Screw Turbines in a run-of-river setting in the U.S. though they are widely employed in the UK and Europe with the safe downstream passage of fish as a primary attribute. At Hanover Pond, a safe downstream passage adjacent to the upstream fish ladder will provide renewable energy site that is “fish friendly” with zero carbon emissions.